I recently bought a bag of plastic beetles in hopes of getting to do something crafty with them. In the past I made beetle jewelry and this time around I put one aside for that but I wanted to try something new. I had a bunch of small frames I bought for another project that never happened - you know how that goes right? 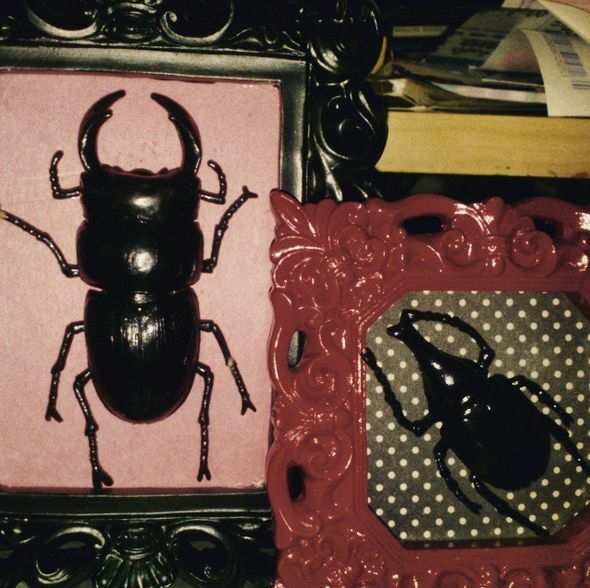 The frames are the perfect size to showcase my new plastic beetle collection. I cut out the plastic protective covering with an craft knife - it is in place of the glass. I used the photo template to trace some random scraps of paper I had in my paper pile to fit the frame. I glued the paper onto the cardboard backing and secured it in place. I then used a heavy duty glue to attach the bugs - my first go around was using a glue gun and the bugs dropped off. I let them dry and they are ready to hang gallery style or perched on an end table.Creepy perfection with a cute kick! I love this. What a great idea. I want to touch them.